David Massouw ruled over the Koranna, a semi Griqua tribe of Hottentots at "Mamusa" on the Harts river within the claimed limits of the Transvaal. For years there had been trouble with Mankoroane, Chief of the Batlapin of Taungs. In October 1881 Mankoroane, assisted by some Europeans, attacked Mamusa. David Massouw raised a force of 400 Transvaal Boers, promising each volunteer a farm (and half the loot). Mankoroane sued for peace in July 1882. The volunteers formed camp on the Losasa and the town of Vryburg was decided upon. A commission (Bosman, van der Berg and Dennison) marked out the town and farm plots, and the plots were allocated by lottery. Plots were 4000 by 6000 yards. One bright fresh evening, after the start of the rainy season, a group of a dozen Boers were lounging around in blankets. When the question of picking a name for the country arose, one of the party, gazing at the stars, suggested Stellaland, and this was unanimously adopted. Olivier Touzeau refers to the Korana (mis-spelled as Koranna, an old colonial variation) as being "semi Griqua". They were a distinct horde or tribe of the Khoikhoi nation, previously referred to as Hottentots, and quite separate from the Griquas. However, like the Griqua they were by this time largely Christian, spoke Afrikaans (or kitchen Dutch, as it was known then), wore similar clothing to the Boer people, and had firearms, horses and ox-wagons. The word Khoikhoi (also written as Khoekhoe, Khoekhoen or Kwekwena) is a re-duplication: khoi means "man" or "human"; Khoikhoi means "men of men" or "true human beings". They regarded themselves as being (as Westerners would put it) civilised because they kept cattle, whereas the Bushmen (who sprang from the same ethnic stock as themselves) were hunter-gatherers. The "-n" at the end of Khoekhoen is an adjective-forming suffix. The "-na" in Korana is a suffix indicating the name of a people, and has the same meaning as the suffix "-qua", as in Griqua and Namaqua (these people are also called Nama). "Taungs" is a colonial form of the place name: its correct Setswana form is Taung, meaning "lion". During Bophuthatswana's "independence" this town was part of that state; it is now the southernmost settlement in North West Province. Stellaland survives in the form of the district of Vryburg, which was part of the colony of British Bechuanaland from 1885 to 1895, the Cape Colony until 1910 and the Cape Province until 1994, and is now part of North West Province. During Bophuthatswana's "independence", Vryburg was an island of Cape territory inside the Tswana state, adjoining the Transvaal. Throughout the life of the Cape Province, Vryburg had its own Deeds Registry, a privilege shared within the borders of the Cape Province only by Kimberley and King William's Town, each of which had also been the capital of short-lived state (Kimberley of the colony of Griqualand West, and King William’s Town of the colony of British Kaffraria). All deeds for property transactions within the Cape outside the areas of Stellaland, Griqualand West and Kaffraria were registered in Cape Town. On this site about stamps is the coat of arms of Stellaland, which explains why a star should be above the Coat of Arms on the 1882 flag of Stellaland. I made the part of the CoA under the star in white and red, and the motto on gold, but I may be wrong with this. The Stellaland flag has been described thus: "Of green bunting with shield in four compartments, with gold-coloured border. Top left compartment, white ground with hand holding bird by leg; top-right, green with five-pointed star in white; bottom left, blue ground with scales; and bottom right, red ground with two fishes pierced by a sword." The shield was surmounted by a five-pointed star with rays, and the scroll beneath was inscribed with the words "Gewapend en Regtvaarig (armed and just)." 1882-85 - "Apparently the republic was named because of a comet that appeared on the night it was declared, hence the five-pointed star in the Arms. In designing their flag they made use of the insignia of the Bechuana tribes. The bird held by the leg is a Korhaan or Massauw, a South African bustard, the badge of David Massauw; the fish are cognisance of Mankoroare, his rival, chief of the Batlapin tribe; and the sword represents its distinction." You show a flag of Stellaland with a green field bearing a shield of arms. This is from Burgers . There is a flag in the Vryburg Museum of which I have a picture. The Arms in your illustration are wrong in form and in colouring. I also challenge Burgers' allotting definite dates to the three Stellaland flags. In Flagmaster 102 there was an article on the Boer Republic flags, derived from my own unpublished monograph, Flags in South African History which provides a more detailed explanation. Nothing to add on Stellaland except that a number of variations did (and still do) exist! Regarding Stellaland, I have read that this was a pretty disorganised "state". In at least one source I have consulted it was stated that there were no formally legislated flag regulations, and that whenever a new flag was needed, the President's wife would run off a new one on her sewing machine. This would account for the three different designs that have been reported. Quite likely only one copy of each was made, and these were seen at different times by visitors who arrived in Vryburg. I cannot vouch for the accuracy of André Burgers's sources, but I have read his manuscript and find it thoroughly researched (from a vexillological point of view). While there are aspects of his work ­ mainly heraldic ­ that I have disagreed with (in private communication with him), he has done valuable work in bringing together knowledge about the history of flags, not only within South Africa but also going right back to classical times. In 1883 the flag was changed. 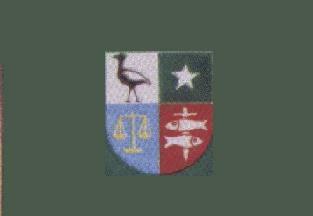 The green field remained, but the coat of arms fell away with only a six-pointed star remaining in the center of the field according to Burgers' Sovereign Flags of Southern Africa, 1997 [bur97].